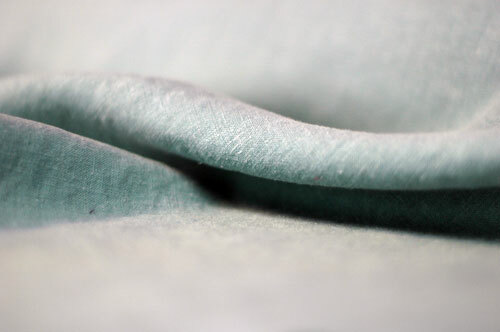 In selecting our fabrics, we look for beauty, comfort and environmental sustainability. Our blend of 55% hemp and 45% Tencel™ merges hemp's strength, durability and colorfastness with the drape and sheen of Tencel™. Our 4-oz Light Weight hemp/Tencel blend is a shirting that we use for tops. Our 6.2-oz Mid Weight hemp/Tencel blend has a heavier yarn that's great for tops, skirts and pants. Hemp grows rapidly and requires little water and no pesticides, fertilizers or herbicides. Its deep roots actually improve the soil in which it's grown. Hemp has natural anti-microbial properties and is resistant to mold and mildew. It absorbs and releases perspiration quickly and breathes well. Its long fibers result in durable fabric that actually softens with wear. Tencel™ is the trade name for lyocell, a fabric developed to emulate the positive characteristics of rayon, such as good drape, breathability and sheen while counteracting its negative environmental impacts. Earth-friendly Tencel™ uses only wood from tree farms and recycles the solvents used to transform the wood pulp into fibers in a "closed loop" system. Combining these two fibers results in a fabric that can be machine washed and tumble dried. We preshrink all of our garments. Light Weight, Mid Weight - What's the Difference? Sympatico tops are made in two fabric weights: Light Weight and Mid Weight. Both are a sustainable blend of woven 55% hemp and 45% Tencel™ (lyocell) that's preshrunk and easily machine washed and tumble- or line-dried. The difference is the Light Weight is woven with a smaller gauge (thinner) yarn. Both weights are soft and comfy and let your skin breathe. Light Weight is a breezy 4-oz. square weave to help keep your summer cool. Used only on Sympatico tops, it dries quickly and is slightly more prone to wrinkles than Mid Weight. It's great in the tropics and on those steamy summer days! Mid Weight is a 6.2-oz. square weave with a little more body. If you want your top to match the color of pants or a skirt exactly, it's better to select the Mid Weight since all the pants and skirts are cut in that fabric. Hemp can be tough, but Sympatico’s hemp and Tencel blend, together with our dyeing process, result in a soft fabric that’s easy to wear against the skin. Tencel is known for its smooth fiber surface that gives it softness and drape without clinginess. It has breathability and moisture absorption for a dry, cool touch on the skin. People with sensitive skin tell me they love this blend. 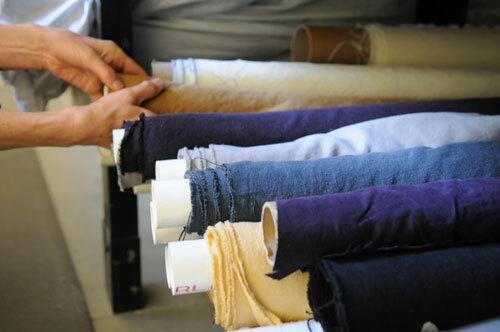 Each Sympatico garment is first sewn in natural, undyed fabric and then dyed. Garment dyeing machines use beaters to ensure the dye penetrates the fabric completely and evenly. The machines look like top-loading washers without lids and with much bigger paddles.